This year has been a bad one for whooping cough (Bordetella pertussis) throughout the world. There have been large outbreaks of pertussis in the United States, England and Australia in 2012. There have been some hypotheses as to why it has been happening. For example, there is some speculation that a subtype (or genotype) of pertussis was responsible for the Australian outbreak, but the evidence is complicated and equivocal. I think there is some evidence that the epidemic in Washington state results from the much lower vaccination rates in the area as a result of the anti-vaccination lunacy. But the story may be much more complicated, and may need a more open discussion amongst those responsible for protecting us from these infectious diseases. These pertussis outbreaks may be a result of the reduced performance of the pertussis vaccine currently being used. The problem with an open discussion regarding the current vaccine is that the vaccine denialists will make an absolute claim that the pertussis vaccine does not work (of course, a complete fabrication, typical of the anti-vaxxers), instead of the more accurate position that the pertussis vaccine might not have the high level of effectiveness that was originally thought. Ironically, the current vaccine, the acellular pertussis version, replaced the older and more effective whole pertussis vaccine because critics believed the older version had too many side effects. 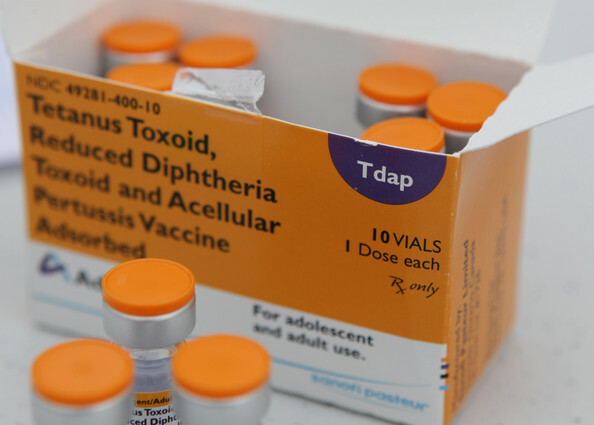 Children who received a 3-dose DTaP primary course had higher rates of pertussis than those who received a 3-dose DTwP primary course in the preepidemic and outbreak periods. Among those who received mixed courses, rates in the current epidemic were highest for children receiving DTaP as their first dose. This pattern remained when looking at subgroups with 1 or 2 DTwP doses in the first year of life, although it did not reach statistical significance. Children who received a mixed course with DTwP as the initial dose had incidence rates that were between rates for the pure course DTwP and DTaP cohorts. Note that during 2010-2011, when the Australian pertussis epidemic started to increase dramatically, the children who received the whole-cell pertussis vaccine had the lowest rate of pertussis. Even children who received the whole-cell version as their first dose had a better outcome than those who received the acellular (and currently used) versions. Others researchers are making similar observations, although only with the acellular version of the vaccine. Physicians from Kaiser Permanente have reported that they were seeing a high amount of pertussis in fully vaccinated pre-teens who had not yet received their final booster dose. 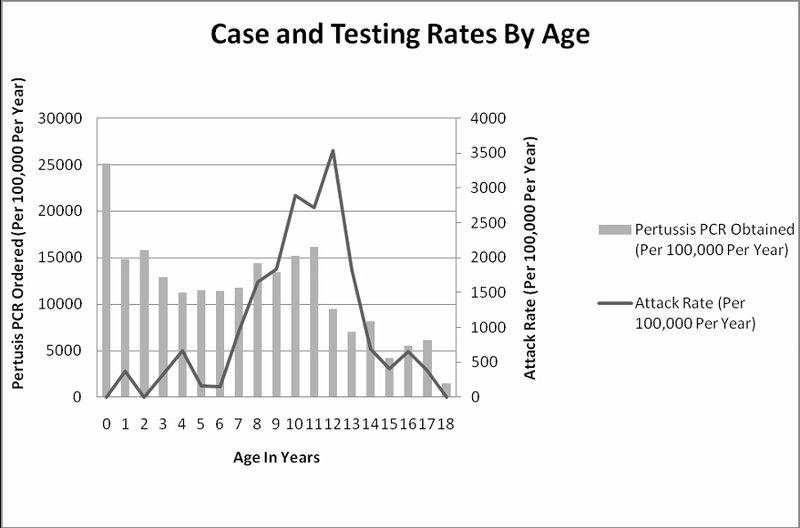 Of 171 kids diagnosed by PCR (polymerase chain reaction) as having pertussis in 2010, 132 were between 8 and 14. The sustaining population of the outbreak was fully immunized by national guidelines but more than 2.5 years since their last booster. Acellular pertussis boosters are effective but less durable than previously thought. Vaccine guidelines and pertussis control measures need to be reconsidered. Even the Centers for Disease Control and Prevention seems to be questioning the effectiveness of the pertussis vaccine. In its July 20 2012 Morbidity and Mortality Weekly Report, which discusses the epidemic in Washington state which I’ve covered extensively. At the end of the report, almost hidden in the appendices was a graph that I almost missed. Acellular and whole-cell vaccines both have high efficacy during the first 2 years after vaccination, but recent changes in the epidemiology of pertussis in the United States strongly suggest diminished duration of protection afforded by childhood acellular vaccine (DTaP) compared with that of diphtheria and tetanus toxoids and whole-cell pertussis (DTwP) vaccine… Since the mid-2000s, the incidence of pertussis among children aged 7–10 years has increased. Moreover, the observed increase in risk by year of life from age 7–10 years suggests a cohort effect of increasing susceptibility as those children who exclusively received acellular vaccines continue to age. In areas like Washington state, where up to 10-20% of children are not receiving vaccinations plus the apparent reduced efficacy of the acellular pertussis version of the vaccine, both the herd immunity and actual immunity to pertussis may be under severe threat. Although the situation seems to be isolated to Washington and a few other areas, it does not mean that it will remain limited. If we have to reexamine the effectiveness of the acellular pertussis vaccine, return to the whole-cell vaccine, revise the schedule of vaccinations, or even develop a newer, better version of the acellular vaccine (or maybe even all of the above), then we need to move quickly. So what does this all mean. You still must vaccine your children with DTaP (or Tdap), since it still confers substantial protection against pertussis. And you must stick to the vaccine schedule, because the boosters are critical to improving the chances of getting a proper immunity. Adults must consider getting the vaccination more frequently than the current schedule. And if it’s been a long time (or you don’t remember when you last had the vaccine), it’s time to get a booster. This situation is now on the radar of the CDC, immunologists, epidemiologists, health departments, and vaccine manufacturers. There will be changes, and probably within a few years. Visit the Science-based Vaccine Search Engine. Centers for Disease Control and Prevention (CDC). Pertussis epidemic–Washington, 2012. MMWR Morb Mortal Wkly Rep. 2012 Jul 20;61(28):517-22. PubMed PMID: 22810264. Sheridan SL, Ware RS, Grimwood K, Lambert SB. Number and order of whole cell pertussis vaccines in infancy and disease protection. JAMA. 2012 Aug 1;308(5):454-6. doi: 10.1001/jama.2012.6364. Erratum in: JAMA. 2012 Oct 10;308(14):1432. PubMed PMID: 22851107.